Left and center: Magnetite- and gold-based nanoparticles self-assemble into lattice-like structures. Right: Individual gold and magnetite based nanoparticles. Credit: Petr Kral. A collaborative group of researchers including Petr Kral, professor of chemistry at the University of Illinois at Chicago, describe a new technique for creating novel nanoporous materials with unique properties that can be used to filter molecules or light. They describe their research in the journal Science. Nanoparticles are tiny particles made up of a central solid core to which molecules called ligands are often attached. Nanoparticles can self-assemble into lattice-like formations that have unique optical, magnetic, electronic and catalytic properties. Experimentalists led by Rafal Klajn, professor of chemistry at the Weizmann Institute of Science in Israel and corresponding author on the paper, produced thin lattice structures made up of two kinds of nanoparticles: one with a magnetite core and another with a gold core. In order to form these thin, lattice-like structures, nanoparticles self-assembled within a layer of drying solvent floating on another liquid in which the particles are insoluble. “The self-assembly mechanisms in the thin solvent layer differ from those at work when nanoparticles are allowed to self-assemble in bulk solvents,” Kral explained. The experimentalists also developed a technique for chemically etching out one of the two types of nanoparticles from the self-assembled lattice-like structures. The resulting material had tiny, regularly spaced holes. The experimentalists then turned to Kral’s theoretical chemistry group, which included Lela Vukovic, assistant professor of chemistry at the University of Texas at El Paso, to help them understand how these lattices formed. 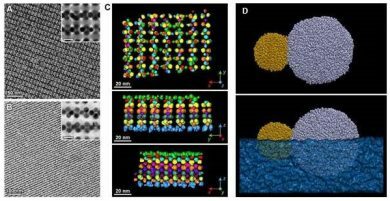 Kral and Vukovic used atomistic molecular dynamics simulations to model exactly how the two different nanoparticles self-assembled into the thin, lattice-like structures. They found that depending on the type of liquids used in this process, nanoparticles self-assemble into different structures. “Based on the known properties of the nanoparticles and the different liquid surfaces they were placed onto, we were able to predict how and why different lattices formed,” said Kral, whose group has extensively studied how nanoparticles interact to form complex superstructures. By changing the composition of the nanoparticles and the liquids on which they self-assemble, Kral said chemists can create a huge number and variety of new nanoporous materials. Different sized nanoparticles would, when etched out, create different pore sizes. Klajn, Thumu Udayabhaskararao, Lothar Houben, and Ronit Popovitz-Biro of the Weizmann Institute of Science; Thomas Altantzis and Sara Bals of the University of Antwerp in Belgium; Marc Coronado-Puchau, Judith Langer and Luis Liz-Marzan of CIC biomaGUNE in Spain; and Vukovic are co-authors on the paper. This work was supported by grant 336080 CONFINEDCHEM from the European Research Council; grant MAT2013-46101-R from the Spanish Ministerio de Economía y Competitividad; grant 1506886 from the National Science Foundation; the Research Foundation Flanders; the Rothschild Caesarea Foundation, and startup funding from the University of Texas at El Paso.